“Hey how’s it going?” I ask. I always pick up when it’s her. Let’s just call her Ham (Her initials mixed up) so I don’t accidentally implicate her in this story. Whenever Ham calls me I get very excited, because I heart her so much. We go way back. Now I also need to divulge that Ham is a flight attendant for a major airline. And once again, since I don’t want to incriminate anyone here, let’s just call the airline Alderaan Air. Wow, so Carrie’s airline of choice was Alderaan Air, who knew? I felt so lucky, what are the odds that BFF Ham would have Carrie as a passenger? 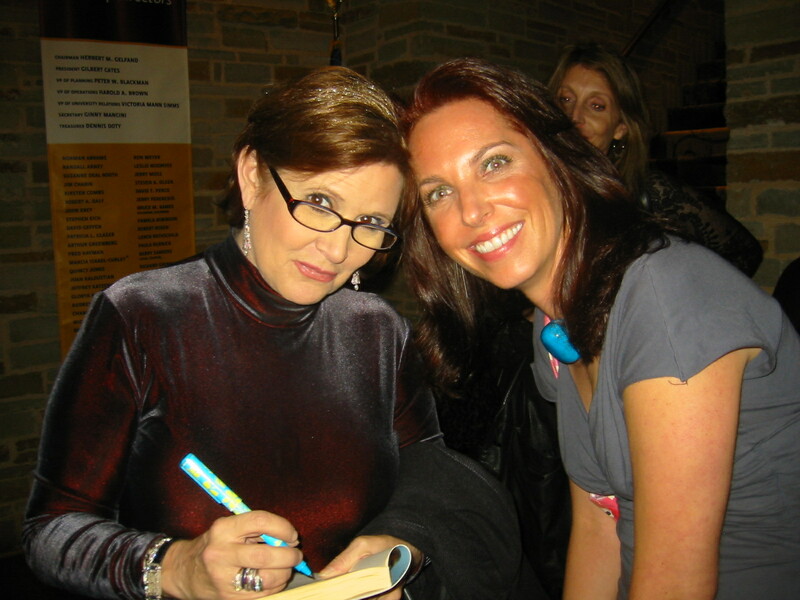 I hearted Ham even more, she’s not necessarily a Carrie fan but she was nonetheless thrilled on my behalf. “Well, ask for her autograph, show her my pic and say I’m her biggest fan!” My heart was pounding. I knew none of this would happen, except MAYBE the autograph part. I could never bother a celebrity on a flight, but Ham had a way with passengers. “OH MY GAWD tell me everything about the flight, GET HER AUTOGRAPH.” At this point, I had only gotten Carrie Fisher’s autograph and pic once, just to make things clear. Ham quickly hung up, I finished folding my sheets, and went to bed. About two months goes by, and I get a package in the mail from Ham. I’m terribly excited because it was my birthday and I love Ham’s thoughtful gifts – let’s just say she gets me. I opened up the manila envelope as if I was ten years-old at a birthday party hoping to score “My Little Pony” and out of the envelope, onto my bed drops three used magazines wrapped up in an Alderaan Air pillowcase. Ok, now let me explain here when I say “used” I mean not hot off the press – instead they were crinkled and folded. Then a birthday card falls out. The magazines were not what I would normally read – Architectural Digest, Elle’s Home Decor, and some other boro home magazine. When Ham and I were roommates back in the day, she’d come home from work with stacks of free magazines and books that passengers left in their seats. It was great and saved me loads of money on what I refer to as “self-hate” magazines – you know the ones that talk about how DO THOSE CELEBRITIES stay so thin? I was stumped. I figured Ham must have forgotten my birthday and as a joke, quickly mailed Alderaan Air passenger trash to me, just like old times. And all at once, my lightsaber went off as I remembered Ham’s phone call from the plane! I was holding Carrie Fisher’s pillowcase and magazines from her Alderaan Air flight to London. I laughed so hard I almost fell into my dresser. I wondered how many fans had one? I’m not gonna lie, it was hysterically funny yet a little creepy at the same time. If Carrie only knew. I called Ham up immediately. We were laughing so hard my stomach hurt, trying to figure out how I could tell friends I got Carrie Fisher’s pillowcase for my birthday without coming off as creepy girl stalker. I mean I only sniffed the pillowcase for the first week. So here I am now, with the princess’s pillowcase. It’s tucked away neatly in my bookcase as a reminder of a force-filled Ham moment on Alderaan Air. I ended up recycling the mags when I moved because, really, the pillowcase says it all. It’s a great story to tell. And Carrie, just so we’re clear, IT WAS A GIFT! This entry was posted in Star Wars and tagged American Airlines, Anne Hurley, Anne Hurley Obot, BFF, Carrie Fisher by laurel. Bookmark the permalink. I love hearing stories about your life. The way you write is so entertaining. I don’t have the patience to sit & read, but you make me want to read. Thanks.